The invoicing module may be customized from under Settings > customize > Invoices. The elements that can be customized are invoice numbers and payment types. Please read the dedicated guide to learn more about customizing invoice numbers. To customize payment types, please select Settings > Customize > Invoices > Payment Types. Here is where you will find a list of pre-existing payment types; which you can edit, and where you can add new ones. Enter a name for your payment type - this will appear within Operate when you will want to select this method. Add an invoice text that will be displayed on customer invoices when referring to this payment type. 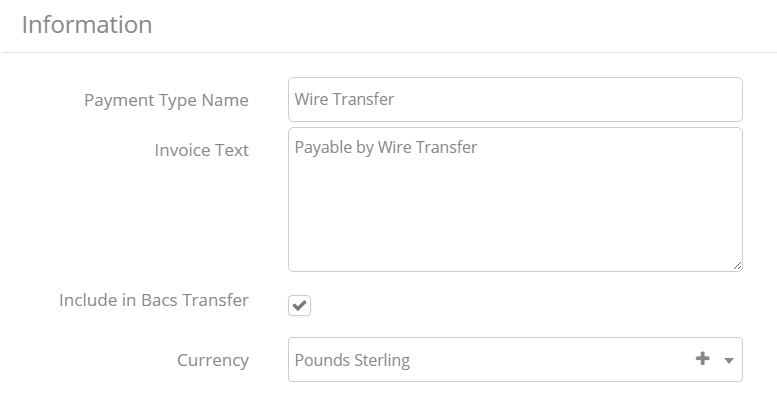 Tick the Bacs Transfers box if you want to include this payment type. Select the Currency that this payment type accepts. Save your settings when you are ready.